New Hope Audubon is steward to a pair of Important Bird Areas (IBAs): Jordan Lake and the Eno River. Important Bird Areas are a designation of BirdLife International, a conservation group committed to avian biodiversity. Currently there are over 12,000 IBAs worldwide. 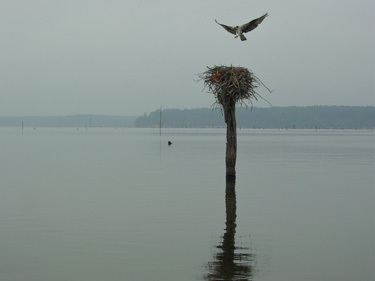 Jordan Lake, which lies largely in Chatham County, is home to one of the largest populations of Bald Eagles in the eastern United States. Recently removed from the endangered species list, the Bald Eagle is an important apex predator that continues to be locally monitored. Jordan Lake is also a breeding area for several regionally significant bird species, such as Brown-headed Nuthatch and Prothonotary Warbler. The Eno River watershed, which drains areas of Orange and Durham Counties, is an important staging area for migrating songbirds. In spring and fall, large numbers of warblers and other species can be found in the trees along the river. Much of the Eno River is now protected by NC State Parks and other conservation organizations. For more information on how to explore our local Important Bird Areas, visit our Get Outdoors link in the main menu.